A naturally occurring mineral, talc is a hydrated magnesium silicate, also known as French chalk or magnesium silicate. It is soft and breaks into small flakes. Cosmetic talc is milled and purified. Ancient Egyptians used talc blended with clays and other materials to make carvings and ornaments. 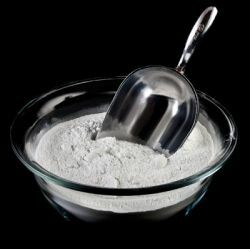 It’s one of the most common ingredients of face powder and other powder-based colour cosmetics. Talc has been used in cosmetics for decades as an absorbent, bulking agent and to give make-up a smooth, silky feel. We use it in Catastrophe Cosmetic for this purpose. Talc has many industrial applications from manufacture of ceramics to its use in paper-making. There have been various worries about use of talc in cosmetic products. These have all been thoroughly researched and there is no evidence to support concerns. The only cautionary measure talc requires is the same one that applies to any fine powder: when presented in a loose powder form, inhaling large amounts (more than during typical cosmetic use) could be harmful to lungs. We’ve used talc in our Cupcake fresh face mask to create an interesting texture and add bulk to the product, allowing it to be easily applied onto the skin. We use talc in our new Colour Supplements, which includes Dark Pink Colour Supplement and Light Yellow Colour Supplement, to create a smooth texture to the base-colours.